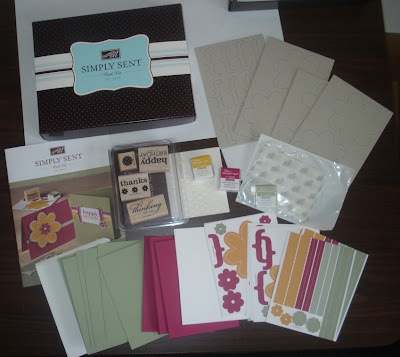 Craftin' Caro: 25% off Simply Sent kits... until October 8! 25% off Simply Sent kits... until October 8! In honour of World Card Making Day on October 6th, Stampin' Up! is offering 20% off all the Simply Sent Kits in the Fall-Winter 2007 Collection. But because it's also Canadian Thanksgiving weekend -- and I'm so very thankful for all of you -- I'm giving them away at 25% off! These kits include everything you need to make a minimum of 10 cards, some even have enough for 20 cards. You will find complete project instructions, accessories, pre-cut cardstock, inks, envelopes and great stamp images!!! Please click on the image to enlarge for an idea of what comes in a kit -- this particular one is the "Three Thoughts" set. I think these would make FABULOUS Christmas or holiday gifts (I know I'm getting the "Happy Day" kit for Serena for her birthday), so why not get started early on that shopping list. When you order any of these kits, add on a SNAIL adhesive for only $7 more, or $5 per refill. Club members, this kit special can be counted as your monthly order -- please let me know if you want to take advantage of this deal. Click HERE for information on ordering in Canada. What's coming up tomorrow on the blog? How about a SNEAK PEEK at an upcoming stamp set, jimbo wheel and new Designer papers from the Spring/Summer 2008 Catalogue???! !